Make time to cook, even if it’s just for you. If you don’t who will? Cooking for yourself is an empowering experience, for when you cook you get to make the decisions. You get to choose whether you’re eating beef or chicken, and if it’s healthy or fattening. At the end of the day it’s all about your whims and desires. That being said, there are many different types of cooks, and you may be any one of these. It is important to know which cook you are, because then you can expand and enhance your cooking experience in whatever type of kitchen you have. Below, I have listed several types/levels of cooks, with a few tips for each one. You love to cook and you are great at it. For you there is nothing more exciting than finding a new ingredient or trying a different combination of flavors. Challenge yourself by making your own recipes or trying a new style of cooking. Whatever keeps you in the kitchen, give thanks for those reasons and keep going. Your body will thank you for it. To enhance your kitchen, go for new and different ingredients like truffle oil, black garlic, and sunchokes. Don’t worry about burning or over seasoning or not knowing where to start. It will all come to you but first you must cook and to make it easier start with a plan. Look through magazines, find chefs that you like and then find their cookbooks. Read through their books and try the recipes you like. If the recipes have a few things you don’t like, don’t worry about it; either leave those ingredients out or experiment with the recipes as they are – you may have found a new combination of tastes you like! The best advice I have for you is to take baby steps to build your confidence, and just keep cooking. Remember you’re learning to cook, and its ok to make mistakes. Open yourself up to all the possibilities, and try to enjoy cooking, and find your own unique style. Don’t worry if the meal didn’t turn out the way you wanted or if it’s inedible, perfection will come with practice. For the beginner cook, make sure you have a great cutting board, chef knife and a good sauté pan. Find a few great recipes and make notes in the margins about how you cooked them, what worked, what didn’t, and what you liked. Create your own cooking log. Follow my advice, and you’ll be an expert before you know it! Most of the year you choose to go out or order in, but every time the holidays roll around you go nuts in the kitchen. You break out all of the pots and pans, research recipes for weeks, and come up with elaborate dishes, which you work like a maniac to create. The result is tremendous, and you get rave reviews, yet you feel tired and overworked from expending so much energy on one meal. 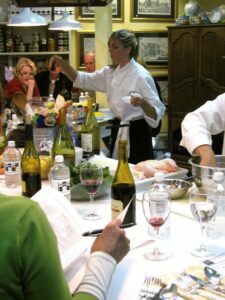 You have the talent, but need to learn to create a balance in your every day cooking life. Create menus and find recipes that will stimulate your curiosity but make them simpler and more manageable meals to keep cooking consistent. Make cooking as easy as possible, and you should see many happy faces on a regular basis without the enormous effort that your holiday meals take. Apply your skills to every day life without wearing yourself out by cutting out easy to make recipes, and posting them on your refrigerator. Keep good easy cookbooks close at reach to encourage you to cook. A collection of beautiful and expensive cookbooks line your shelves. You have memberships to every food magazine there is, and you eat at the hottest restaurants. Your love of cuisine makes you a great potential cook, but also a very difficult person to cook for. Because you know how everything should taste, you are frustrated when you cook and cannot make it come out quite the same. Cooking is an art and a skill. Use eating out to your advantage by cooking something that you would normally order, noticing any lack in taste, and asking the chef for advice the next time you eat out (be sure to flatter the chef with compliments). Cooking for yourself will make it easier to have conversations about cooking techniques, which will increase your status as a knowledgeable “foodie.” Use your love of food as inspiration to cook in the comfort of your own home. You’ll spend less money and have more fun. Make your home cooking experience an elegant, upscale meal, so don’t forget to buy beautiful plates, bowls and silverware. When you sit down to eat your meal, it will feel as if you are eating out but better, because you made it. Your cooking reflects your confidence, and allows you to feed yourself and your family to the best of your ability. Because you work to feed others, you focus on getting the job done, and stick with dishes you know, and are comfortable with (i.e. Lemon Chicken, spaghetti, tacos). Expand your repertoire by adding something new to your menu, and continue to build it for years to come. Try using the weekends to get out of your comfort zone, and try new things. Add a new flavor to a familiar dish, and you will not only get the job done, but you will have a limitless variety of dishes at your disposal. Add a bulletin board or a chalk board to your kitchen and write out your weekly menu to keep track of everything you make. This will give you a sense of accomplishment and allow everyone to see what you are making. You have been there cooked that and now your uninterested in cooking but you can’t stand what you eat out. Well get over it, you have to eat so cook what you like and if you’re not happy with the way you use to cook (method, planning, recipes) then start again with a new plan that is nothing like what you use to do. Try starting and thinking over. Don’t buy familiar brands, branch out and find new ones, if you didn’t menu plan before try it, if you didn’t then try winging your recipes. You can also try getting suggestions from people or family.